For Christmas, Matt gave me a basket overflowing with hop goodness. Included were four large bottles of IPA, hop-flavored hard candy (really! ), and a 4oz packet of "Zythos" hops. I've never worked with them before, but as Matt explained to me, Zythos are a proprietary blend of hops made by the Washington State-based company Hop Union. 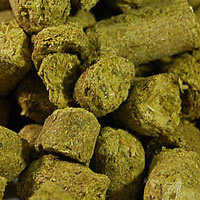 One benefit of these hop blends is that they help to meet the market demand for super-charged, high alpha-acid hops, but don't have to rely on a single hop cultivar. A lot of products, from whiskey to olive oil, are regularly blended to produce a uniform flavor profile from year to year and harvest to harvest. To be honest, I had no idea this was done with hops, but as Matt told me, it's more of a recent development for homebrewing. Some craft brewers, however, have created their own "house blends" to keep their flagship beers hard to replicate. So to test the Zythos blend out (which is named after the Greek word for beer), I brewed a simple IPA using light malts, victory, and a good amount of wheat to help give it a frothy head. I boiled for 60 minutes, hopping one ounce at 60 min, one ounce at 15, and the last two ounces in the final 5 minutes. Right now, it smells juicy and citrusy, with some big piney flavors somewhere in the back. I'm really excited to try this out in a few more weeks!